Remember the day I was saddled with the pager? Everyone left the kindest comments hoping my day went ok. I'm so traumatized I can't string together words in any eloquent or clever fashion which depict or give that day it's justice or you a laugh. Ellen, from Sisterhood of Sensible Moms commented her pager gave her PSTD. I think I'm suffering the same fate, my friends. Please forgive me, but all I can manage is a listing of the day's events and a few things I learned. People don't become emergently sick at any random hour. No, even though their symptoms and pain have been lurking around for days, they always decide to beckon wildly at the most inconvenient times. It all seems to begin at 3pm as everyone else is beginning to wind down their work day. My morning wasn't bad. I just carried that sucker in my bra cup like it was a pacemaker outside my body. The box squawked just a couple pages which I forwarded as instructed, via text message to his cell phone. There are only four buttons on Doc H's pager. Those were enough to thoroughly confuse Your Doctor's Wife. I was panicked. Would I/could I accidentally delete a page? Then what? They'll have to page again, but how many minutes will that waste? I prayed that if I had deleted any it was just a page from a nurse asking for discharge orders or another elementary question which did not demand immediate attention. Then came a page from a doc from an affiliate hospital. I text. A couple minutes later another page from the same doc. Uh. Oh. While I did make it through my shower without a page, my cup squealed while I was in the hover position over a public commode. I began to fish it out of its holding place, but was having a bit of trouble which evoked premonitions of the sucker swimming in the toilet. I decided I should let it wait until I could wash my hands. I put those kegel exercises to the test. I pick up D3 from school. I'm driving on a busy and congested highway...and BEEP! BEEP BEEP! I wish it was a cute little VW bug vying for my attention. I can't text and drive. I can't pull over. I ask D3 to text the page. She does as told. Before we reach home, my car rings (yes, my whole car. I can't figure out how to turn down the ringer on the hands free blutooth.) It's Doc H. His voice is muffled. Another "uh-oh" moment. He's calling from inside the OR. Normally, he'll break scrub to call when he needs to talk to me. Now, he has a nurse holding his cell phone up to his scrub cap and he's talking to me through his mask. More emergencies, more unscheduled cases equal late night. He hasn't had time to eat and doesn't see any break in the day. Bad day. And that's exactly how it went and how it continued to go. He came home at 12:30am that night when I handed the pager over to him. He was able to sleep until 2:30am when the pager went off again and he sprinted back to the OR. But this time, the pager beckoned from his side of the bed... so much better than my side. Now, do you want me to tell you how he couldn't leave the hospital until noon the next day even though he was officially on vacation at 5pm the previous day? Hope you can have a more relaxing weekend!!! I'm back! yay! I look forward to what you post. I like your writing (and your X-ray shoe). My chest is a little to large to efficiently hold a pager in one of the cups! My mom carriers her cell phone there all the time and I can't tell! Whew! I'm so glad Pagers are not common (possibly non-existent) in my environment. Yikes, that sounds so stressful! Hopefully you don't have to do that too often! Found you on the weekend blog walk. 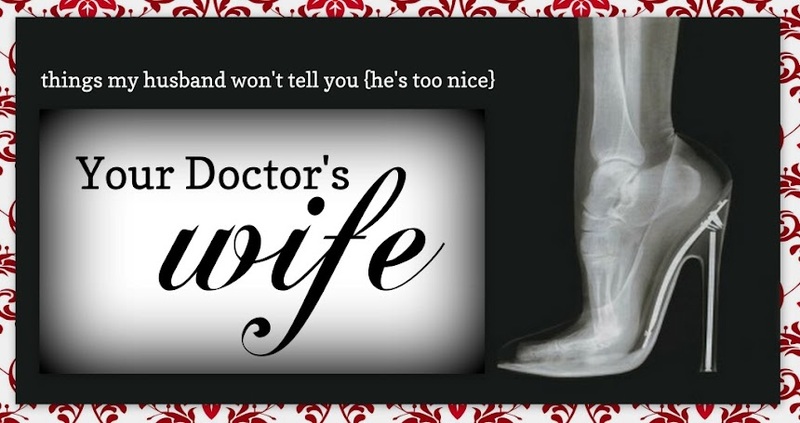 As a fellow doctor's wife I can totally relate to this. Not long ago my husband left his pager at home too (on a day he was on trauma call no less). I offered to drive 20 minutes to drop it off at the hospital but he said I didn't need to - just text the messages. Next time I'll drive it out to him. I can't even imagine. My hubby forgets his cell phone (he needs it for work)...I totally just drive it to him...even if he is an hour away. I want NO part of it...ick! Happy SITS day! I know this is old, but oh my goodness I can relate! My husband is an MIS fellow and has left his phone at home before. It's horrible! They all contact each other with their phones now, not pagers. So not only can I not reach him, have no idea where he is because of his crazy schedule I can't ever keep track of, but he also gets calls and texts from work, and every time he gets one I panic- if I don't answer, they'll think he's either ignoring them or being lazy or inattentive. If I do answer, they'll know he doesn't have his phone, and he's screwed that way too. I usually end up getting a call or text from a med student/resident/drug rep etc that is with him, and all I can think is "THANK GOD!" because it usually means I can finally pinpoint him and give the thing back! A Surgeon's Mantra: "I Hope I Don't Kill Him"
Meet & Tweet Twitter HOP!